Goodnight hiss: Look what a Spring woman saw on her doorbell camera! Allison Keller wasn't ready for what she saw when she checked her doorbell camera at her home in Spring. 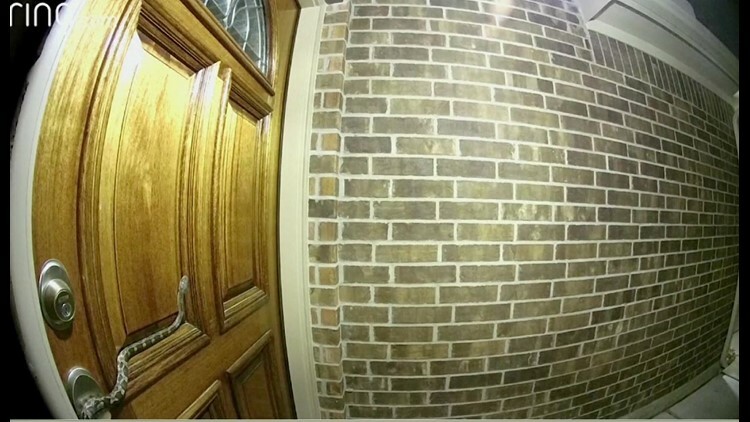 SPRING, Texas — It’s always a little unnerving when you get an alert at 2 a.m. that someone is at your door, but Allison Keller wasn’t ready for what she saw when she checked her doorbell camera at her home in Spring. In the surveillance video, she could see a large snake slithering up her front door. It crawled on the door for a few minutes, fell off and then crawled right back up. “It was just kind of on the side and then it started slithering. Then you see how big it was. I had no idea if this was a venomous snake or a friendly snake,” said Keller. Most of us can agree, few if any of us would know what to do; with the exception of Riki Treadway of Riki’s Reptile Relocation. She said she expects a lot more stories like Keller's to become commonplace in the next month. “Rat snakes are amazing climbers and they’re climbing your frame or your wall, their following the scent of a rodent or a bird,” said Treadway. They aren't poisonous, but still enough to give you the chills. In the past two days, Treadway has received a dozen calls for snakes needing to be captured near residential properties. As she explains, rain and fluctuating temperatures force snakes to choose whether they want to stay in more rural areas or venture off into the crevices of nearby homes. “If you can fit a pencil through, they’ll find a way through,” said Treadway. Thankfully getting rid of the snakes won’t take much effort according to Treadway. One option is to use a broom or a long enough stick to force the snake away from the home. As she explained, the idea that the snake will chase you is a myth, much to the relief of many people who’ve ran this scenario in their minds while reading this. “As long as you don’t have anything they want, they won’t bother with you,” said Treadway. Meaning if you have something these critters want, expect a visit. Now if you’ve got the courage to snap a picture of the snake, you can send it to Treadway. She says it only takes a few moments to find out what type of snake it is and if it poses a risk. She can be reached at 832-705-5505 or Rmille34@yahoo.com.